THE first Cuestars rankings champion from Wiltshire since 2013 wrapped up his triumphant season by picking up a fourth winner’s trophy. 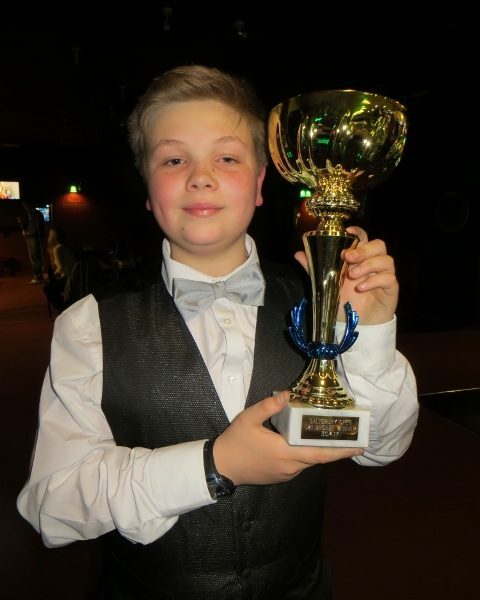 Riley Ellis has already secured top spot before the tenth and final leg of the Under-21 Bronze Tour at Salisbury Snooker Club. But the 13-year-old from Clyffe Pypard, near Royal Wootton Bassett, was in no mood to take his foot off the pedal in the event sponsored by Attic Life. Ellis defeated Ronnie Sullivan (Coulsdon) 2-1 in a hard-fought final when his opponent fouled the pink and conceded in the decider. “He did some great pots and great safety shots,” admitted Ellis. The teenager revealed his target at the start of the season was to win one event. But after achieving that aim in the fifth leg in Bournemouth, in January, and then overtaking Shane Kearns (Swindon) at the top of the rankings following victory in Havant the following month, his sights were raised. “That was when I thought I actually stood a good chance of winning,” he said. Ellis at least reached the semi-finals in all ten events during the 2016/17 campaign and has only once failed to qualify for the knockout in 18 legs since his debut in October, 2015. Meanwhile, there were two sets of dramatic three-way play-offs to eventually find the two best third-place finishers from the three round-robin groups. Riccardo Drayton (Chandler’s Ford), O’Shay Scott (Chandler’s Ford) and James Woodley (Nailsea) had identical records behind Ellis in their group. Only four points separated the trio in an aggregate points tie-break. Drayton qualified and eight-year-old Scott, in third place, missed out on another play-off with Arnie Petty (Fordingbridge) and Oliver Cooper (Banstead) from the two other groups. Oscar Livesey-Lodwick (Nailsea) made the knockout for the first time but lost 2-1 to Ellis. Kearns secured the runner-up spot in the rankings when third-placed Chloe White (Havant) failed to qualify for the quarter-finals. Sullivan and Thomas Saunders (Braintree) are joint fourth. The top-16 ranked players will be invited to the championship play-off on finals day on Sunday, May 14, at Jesters Snooker Club, Swindon. World number 34 Mark Davis will present the trophies and play exhibition frames against all the champions. For more information about loft conversion experts Attic Life, visit www.atticlife.co.uk. ROUND-ROBIN GROUP A: 1st, Shane Kearns (Jesters, Swindon); 2nd, Will Forster (Mayfair, Gosport); 3rd, Arnie Petty (Salisbury SC); 4th, Chloe White (Copnor SC, Portsmouth). ROUND-ROBIN GROUP B: 1st, Ronnie Sullivan (Frames, Coulsdon); 2nd, Oscar Livesey-Lodwick (Nailsea SC); 3rd, Oliver Cooper (Frames, Coulsdon); 4th, Thomas Saunders (Stepfield SC, Witham, Essex). ROUND-ROBIN GROUP C: 1st, Riley Ellis (Jesters, Swindon); 2nd, Riccardo Drayton (Chandler’s Ford SC); 3rd, O’Shay Scott (Chandler’s Ford SC); 4th, James Woodley (Nailsea SC). QUARTER-FINALS (12 points): Kearns 2 Cooper 0, Sullivan 2 Petty 1, Ellis 2 Livesey-Lodwick 1, Drayton 2 Forster 0. SEMI-FINALS (15 points): Ellis 2 Drayton 0, Sullivan 2 Kearns 0. FINAL (25/18 points): Ellis 2 Sullivan 1.